Newt’s Clintonian Stance: Deny, Deny, Deny | Newt’s Clintonian Stance: Deny, Deny, Deny – The Republic of T.
There are some interesting details about Newt Gingrich’s response to ex-wife Marriane’s explosive revelations. How Clintonian of him.First, this is the most interesting parsing I’ve read of Newt’s denial yet. I think that proves too much. Marianne says she turned Newt down on the open marriage. So how would the personal friends know anything about there being an open marriage, if no one says there ever was one? 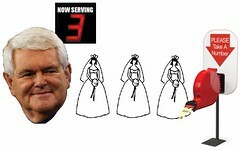 It’s not news that Newt has gone through two divorces. The unasked question is not whether Newt Gingrich wanted an open marriage then but whether he is in one now and would be in one if he were elected President. Speculation aside, no evidence has been offered on that yet. Yeah, why would Gingrich need to send personal friends out to deny a conversation occurred between him and Marianne? What would they even know about it if it never occurred in the first place? The most they could say would seem to be that they never heard anything about an open marriage, or that there wasn’t an such thing as far as they knew. Then there’s another strange question. Why would Newt’s friends know anything about it? Why would it even come up? If it happened, it wasn’t a discussion they had at a dinner party or something, it was a private conversation between two spouses that only the two people in the room and the flies on the wall would know the details of. And then, of course, there’s Newt’s record to consider. He may say Marianne is lying about the discussion of an open marriage, but it’s already been shown that Gingrich himself lied about the circumstances behind his divorce from his first wife, Jackie. … The documents, and interviews with people close to the couple at the time, contradict the Gingrich claim about who wanted the divorce. Jackie Battley Gingrich, the congressman’s wife and the mother of Jackie Gingrich Cushman, responded by asking the judge to reject her husband’s filing. “Defendant shows that she has adequate and ample grounds for divorce, but that she does not desire one at this time,” her petition said. Given Newt’s habit of proposing to the next wife before divorcing the current wife, it’s easy to understand him wanting to get the ball rolling. The same piece also suggests Newt does have a habit of blabbing to friends about his wives and marriages. Leonard H. “Kip” Carter, a former close Gingrich friend, backed the contention that it was Newt Gingrich who wanted the divorce. 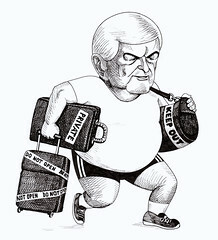 “He (Gingrich) said, ‘You know and I know that she’s not young enough or pretty enough to be the wife of a president,’ ” Carter, who now lives in South Carolina, told CNN recently, relating the conversation he had with Gingrich the day Gingrich revealed he was filing for divorce. Carter served as treasurer of Gingrich’s first congressional campaigns. Carter, who was a fellow history professor when Gingrich taught at West Georgia College in Carrollton, said he broke off his friendship with Newt Gingrich because of the congressman’s treatment of his wife during the divorce. Asked in an e-mail whether that conversation in 1980 occurred the way that Carter recounted, Gingrich spokesman Hammond did not respond. Interesting point about Newt’s current marriage, if Newt really did say to Marianne that bit about, “You want me all to yourself, but Callista doesn’t care what I do.” That may have been Callista’s big selling point — finally a wife who didn’t care what Newt did, or who he did it with, so long as he kept her in jewelry and Greek cruises (if Newt’s former campaign staff is to be believed). Then there’s his take on the media’s treatment of it. King asked Gingrich to respond to allegations by his ex-wife that in 1999,Gingrich asked her to have an open marriage with him. “Would you like to take some time to respond to that?” asked King. “No, but I will,” responded Gingrich, receiving loud, sustained applause from the audience. “I think the destructive, vicious, negative nature of much of the news media makes it harder to govern this country, harder to attract decent people to run for public office. And I am appalled that you would begin a presidential debate on a topic like that,” he said. Funny, but that’s not how he was talking back in 1998. It was quickly pointed out that on matters of infidelities and the media’s right to ask questions about them, the former House speaker has not always been consistent. The speaker once again pledged to say during every public appearance that Americans have the right to know the truth about the Lewinsky matter and that the president is not above the law. Of course, we already know that as president Newtie plans to place himself above the law.